The network is holding a prime-time debate, “Inmigración: Un Debate Nacional,” about proposed immigration reforms on Friday. It is also releasing a poll on immigration conducted in conjunction with the Associated Press. This is not Univision's first foray into the immigration issue coverage. 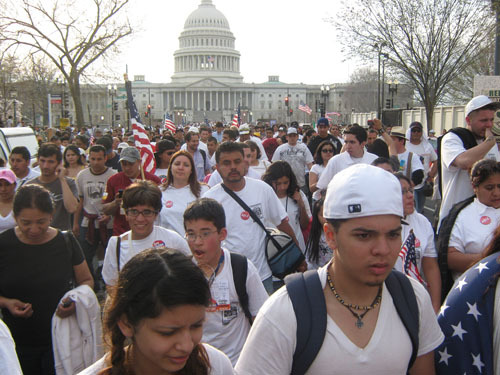 The station ran hours of live coverage on May 1st of this year when protesters gathered across the country to call Congress to enact on immigration reform and to show anger toward Arizona's SB 1070. Univision scheduled hours of live coverage, relying in part on its local stations in markets like Los Angeles. English language cable news channels like CNN and Fox News featured the rallies in their newscasts, but did not provide wall-to-wall coverage. Adryana says that she supports the Arizona Immigration bill in part because "We need to protect our borders and get an immigration solution that is sensible and realistic. I cannot be against the Law because it would be against my value system." Also appearing in the debate in support of the Arizona bill are Maricopa County, AZ Sherrif Joe Arpaio, Arizona House member Steve Montenegro, and Jack Martin from FAIR. Governor Jan Brewer of Arizona has been invited to participate, but TexasGOPVote.com has not recieved confirmation of her attendance as of this time. Speaking in opposition to the bill are Florida Congressman L.D. Balart (R-FL 21st), Alfonso Aguilar, a George W. Bush appointee to the U.S. Citizenship and Immigration Service (U.S. CIS), the Chief of Police for the city of Tucson and the Sherriff of Pima County, AZ. The broadcast airs later tonight; 9pm central time on Univision. Check you local listings for channels. We do NOT need immigration reform. We need immigration ENFORCEMENT! I have to show my ID when I board a plane and I am paying. Don't you think people looking for government handouts should show ID proving they are here legally? At present, Article 67 of Mexico's Population Law says, "Authorities, whether federal, state or municipal ... are required to demand that foreigners prove their legal presence in the country, before attending to any issues." That would simplify things. We do NOT need immigration reform. We need immigration ENFORCEMENT! There is NO SUCH WORD AS 'ILLEGAL IMMIGRANT" in Blacks Law Dictionary, or In Merriam Websters Dictionary. Get Educated . "Gov. Arnold Schwarzenegger said Wednesday that the claim by some conservative activists that illegal immigration is to blame for all of the state's fiscal problems is ignorant and bigoted." On this second point, the quote from Mark Twain is illustrative. "A lie can travel halfway around the world while the truth is putting on its shoes." I suppose this may be true in part because misinformation, like a lie, requires no accuracy, validation or research; all of which are time-consuming practices. The recent letters alleging that all undocumented workers are "criminals," and specifically Veronica Suarez, whose plight was written about in the Tracy Press recently, is a criminal are factually incorrect. Furthermore, it is an Americanism that a person is innocent until proven guilty. So until Suarez (or any other undocumented person) is charged and found guilty of a crime, it would be inappropriate to call them "criminals." Franceschi is also in error in her allegation that getting married and having children while being undocumented in the U.S. is a violation of the law. It is not. Franceschi goes on to say that Suarez "apparently bought a house illegally." It is unlikely that Franceschi knows exactly how Suarez purchased her home. Consequently, any allegation of illegality is, at a minimum, irresponsible. It is also important to note that the Immigration and Citizenship Services doesn’t consider all undocumented persons criminals. When the Immigration and Citizenship Services publishes information about its enforcement activities involving undocumented workers, it are always sure to make a distinction between "criminal" and noncriminal aliens. Another myth is that the term "illegal aliens" is a term of art or is legal jargon. This term is not found anywhere in the INA or in Blacks Law Dictionary. The INA refers to undocumented persons as either an EWI (entered without inspection) or as someone who has overstayed their visa. "Illegal aliens" is a term invented by anti-immigrant groups designed to put undocumented persons in the worst possible light and to instill fear in Americans. It is intentionally designed to associate undocumented persons with criminality. This xenophobic view that undocumented persons are "simply criminals" comes from the historical stereotype that the foreign-born, especially undocumented immigrants, are responsible for higher crime rates. This misconception has deep roots in American public opinion and popular myth. This myth, however, is not supported empirically and has repeatedly been refuted by scientific studies. Both contemporary and historical data, (including U.S. governmental studies) have shown that immigration is associated with lower crime rates.